Another year in the rear-view mirror. This was supposed to be the year I got back on track and released a bunch of albums to make up for lost time. The getting-back-on-track part happened in a big way. 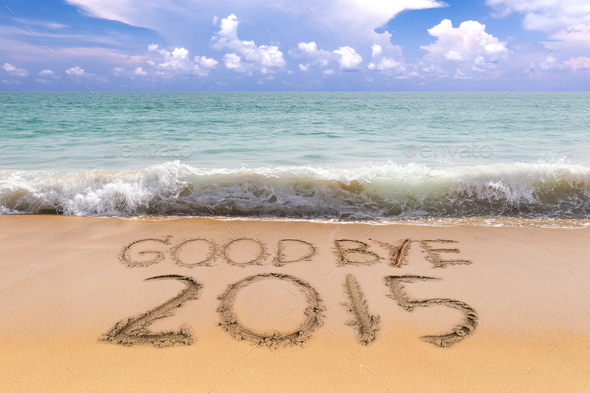 2014’s madness bled into 2015, and the year was packed with a lot of music being made with a lot of great people. The releasing-a-bunch-of-albums part…didn’t work out quite as well. If you don’t count the Tire Swing Co. EP TIME AWAY (which was released on Christmas Day in 2014 but didn’t get a physical release until early 2015), only one album managed to sneak its way across the finish line right before 2015 breathed its last. There were some good reasons for that, though. 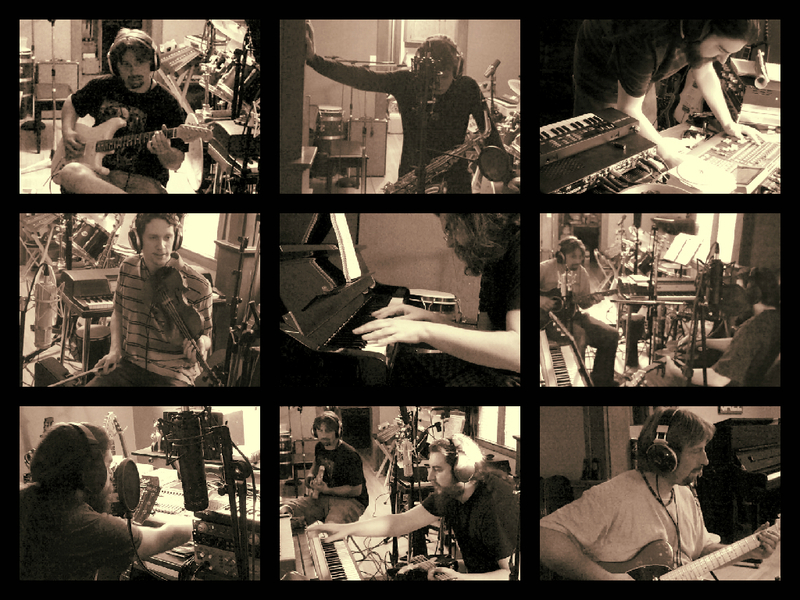 The solo album with many guests (aka YEAR OF THE SLEEPWALK) kept evolving, with more musicians and singers becoming a part of it, and then it grew an unexpected extra wrinkle that…well, you’ll just have to wait and see. The O-L West album also grew beyond what we thought it was going to be. and with more collaborative things popping up all the time, and some more unexpected work recording other people, it all got a little chaotic (in a good way). I guess one way to look at it is this: it’ll be a lot easier to get all of these things finished in the New Year, since a lot of the legwork is done now. I might be late to the party, but I always show up eventually, drugs in hand. Okay, almost always. And usually with drugs. Sometimes it’s a feral turtle instead. Who’s keeping track? I’m not going to say my old nemesis THE ANGLE OF BEST DISTANCE finally gets conquered in the next twelve months. That’s probably a fridge too far. But a lot of other things should see the light of day. So here’s to bombarding a small handful of people with lots of new music in 2016. A collage that didn’t make it. Here’s something that almost made it into the booklet for STEW but didn’t quite get there in the end. I wanted to put some pictures of us in there and thought the easiest way to do that would be to grab some video stills and make a collage. I liked the way it turned out (Ted and Stu are in there too! ), but when I was putting everything together for some reason it felt more appropriate to keep the inside of the booklet image-free. So, this thing is finally done. Its official release date — though I wasn’t able to get copies to more than one or two people because everything closed early for the holidays — was Christmas Eve, which has never happened before and will probably never happen again. It looks pretty spiffy, I think. Most of that has to do with Greg Maxwell’s beautiful artwork and background textures. I kept the rest of the layout very minimal, because I didn’t want anything to detract from the cover image, and because I like keeping things pared-down visually. I did dust off the old “treating the CD a little bit like a mini vinyl record and putting all the song titles on it” trick for the first time since CREATIVE NIGHTMARES, though. Gotta mix it up. For once I was able to avoid any soul-destroying typos in the initial run of booklets. There is one line that doesn’t match what’s actually sung in the song, but that’s intentional. The last line of “Fly’s Hive” before the long instrumental midsection is, “Through the blinds of your best window watch the city crumble, and tremble as you see all that you loved learn how to crawl.” I had a momentary brain fart when we were recording the vocals and sang, “See all that you loved turn into dust,” instead of what was on the page. I liked the way it sounded, even if it was a weaker line than what was written, so it got to stay. I’ve always presented the lyrics “as written” — meaning what you see in the booklet doesn’t usually take into account mid-song improvisations where words are sometimes altered or replaced on the fly. I think it’s more interesting that way. It’s a way of honouring the reality that all of this stuff is in a constant state of flux every step of the way. At the same time, every word in “Remorse Code” was improvised, and those lyrics are transcribed in the booklet. Normally I would leave a thing like that out and let people work out for themselves what they thought i was singing. There is no “as written” when something was never written at all. But Gord asked if I could include those words, and I couldn’t think of any good reason not to. 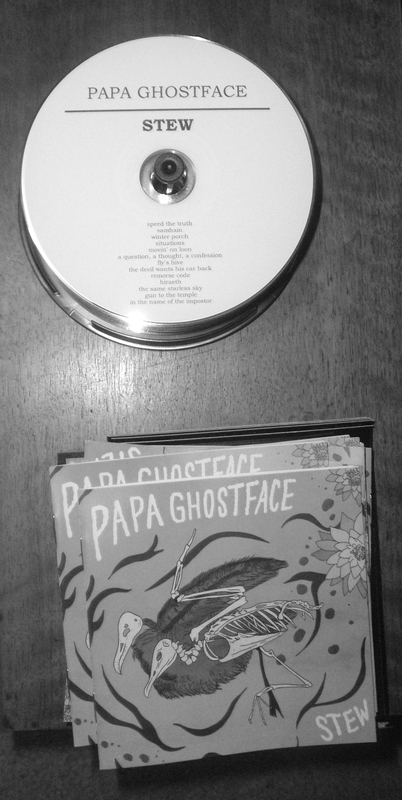 This is the shortest Papa Ghostface album there’s ever been if you don’t count LIVE AT SILVERS (and you shouldn’t, because that one kind of stinks). But it still feels pretty hefty. It’s just got some actual rhythm and flow to it, which wasn’t always the case in Papa Ghostface days of old when my attitude was, “Let’s vomit a whole bunch of stuff onto a CD and see if we can make it fit within the time constraints of the media.” If it’s going to be the first PG album most people have ever heard, that’s kind of fitting, because it feels like something of a new beginning for us. Gord played acoustic, electric, and acoustic archtop guitars, bass, djembe, tenor banjo, pitch-shifted triangle, recorder, bucket and spatula (the simulated river sounds on “Movin’ on Loon”), tambourine, clapped his hands, and sang a little. That’s also him playing the dramatic cymbal swells on “In the Name of the Impostor” before the proper drums kick in. I played acoustic, electric, and classical guitars, piano, lap steel, bass, drums, shaker, African drums, six-string banjo, harmonica, mandolin, ukulele, backwards glockenspiel, Casio SK-1 (samples and mangling), Acetone combo organ, a little bit of Alesis Micron and Korg Monotron Delay, clapped my hands, and sang a lot. Greg maxwell made the cover art. Theodore Hogan played alto sax on “Speed the Truth”. Stu Kennedy played violin on “A Question, a Thought, a Confession”. I realize the logical thing here would have been to hold off for another week and make this album a 2016 release, coming straight out of the gate in the new year. But I am not bearded Spock. I kind of like the way the thing has automatically been disqualified from being eligible for any best-of lists for 2015 or 2016. Take that, meaningless lists! Besides, I had the inserts printed with 2015 on them before that mega cold knocked me out for a while and delayed what likely would have been a November release. I didn’t feel like paying a second time to change that one thing if I could get everything ready to go before the end of the year. And I’ve never liked sitting on things. When they’re done, they’re done. This one’s done. This is the first album to feel the full impact of the “no more free public distribution” thing. So we’ll see how that goes. It’s still free, but the plan is to share it with friends and CJAM allies, a handful of people who are on the kinda-sorta-mailing list, and leave it at that, pretty much. I’m glad to send copies to people I don’t know, but I first need to know there’s some interest there. Not really feeling the appeal anymore of throwing several hundred copies of a thing out there blindly and not knowing where most of them will end up. If I have your current address and you acknowledge that I exist once in a purple moon, you can probably expect to get a CD soon. If I don’t know you but you’d like a copy, feel free to get in touch with me or Gord and we’ll do our best to get one to you. Here’s a little instrumental tune that didn’t make the cut, just because.